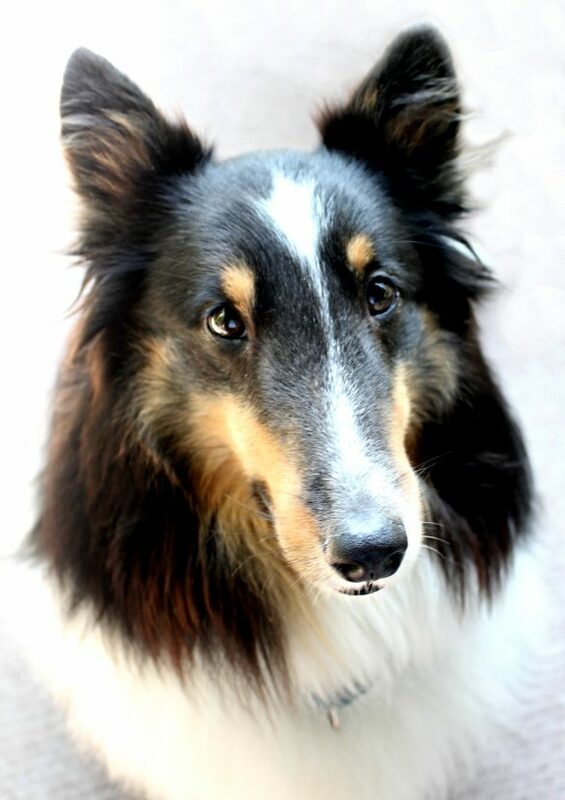 Pax the Sheltie is my buddy. He is loud, loyal, so smart, and my dedicated body guard. Where ever I am, Pax is. On baking days, he is often powdered in flour as he lies at my feet while I bake. On writing days, he is under my desk in the winter or in the summer you’ll find him on top of the air conditioning vent right outside my office. I love him. Pax was about 6 months old when he adopted me. For 6 long months he had lived in a cage at a puppy mill and later at a shelter. When he finally got to his forever home, he was afraid of a lot of things. He was totally freaked out by wheels: car wheels, bike wheels, stroller wheels. My puppy needed exercise, but there was no way he would walk on the sidewalk. Thankfully, we discovered a wonderful dog park not far from our house. 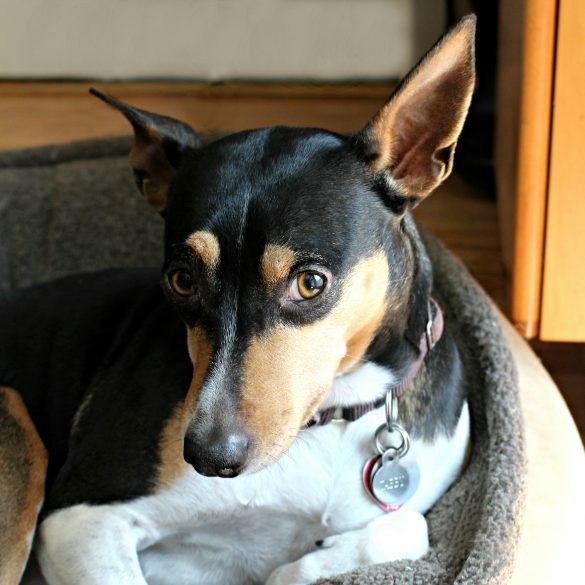 At the dog park, Pax met Tabby the Rat Terrier. She is super gentle with humans, a fierce huntress of all rabbits and rodents, and a “my way or the highway” sort of gal with other dogs. Pax, the push over, fell instantly in love. The two dogs share an unusual bond. Because of their bond, I formed a friendship with Tabby’s human. For five years, in all kinds of insane weather, we met at the dog park daily and talked as our dogs played. That was a lot of talking and a lot of playing. Two years ago, Tabby’s human had surgery that required extensive recuperation time. You may have seen on Instagram that Tabby came to stay with us for the summer. Then, this summer, Tabby’s human and my dear friend, had to ask me if I would be willing to be Tabby’s legal guardian. There was only one possible answer. Now there are two dogs barking at my husband, lying curled up on dog beds all over my house, and begging for Paw Prints Peanut Butter Dog Cookies. I have baked a lot of dog biscuits: I bake Paw Prints Peanut Butter Dog Cookies for my own dogs, I bake them for our friends at the dog park, and I bake them for doggie care packages that I mail most often to two chocolate labs in Chicago. 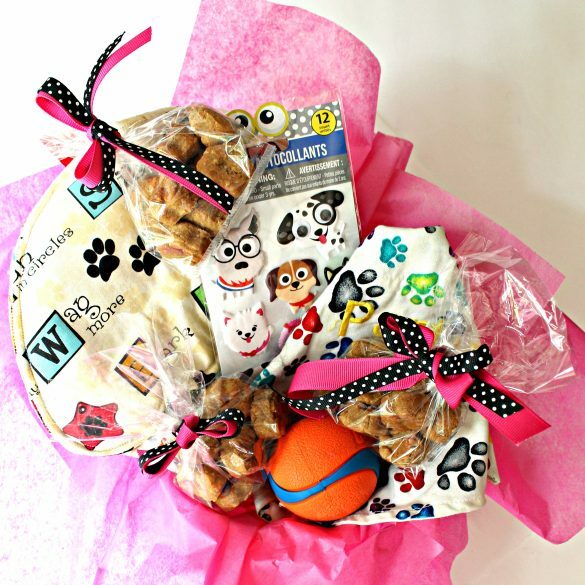 Creating your own Paw Prints Dog Care Package is easy. 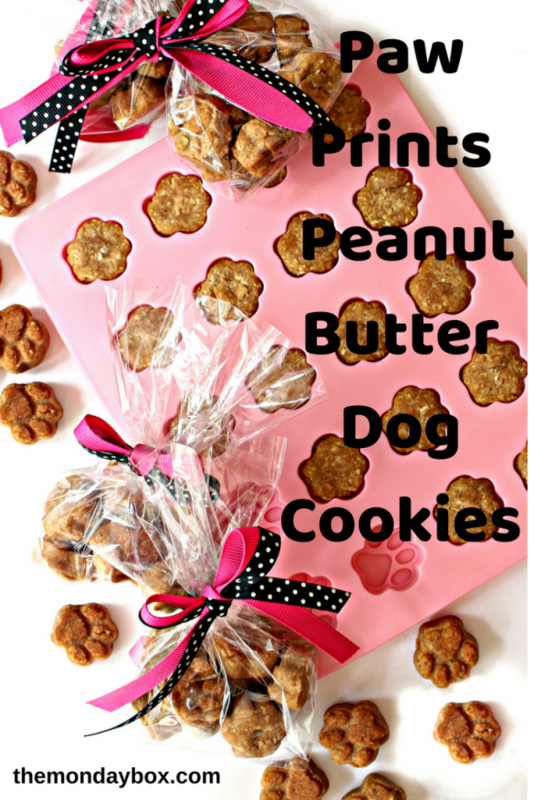 Add few bags of Paw Prints Peanut Butter Dog Cookies, a dog toy or two, and a paw print bandana or pot holder. Both dogs and humans will be smiling when the box is opened! This is my favorite of all of the dog biscuit recipes I’ve tried and I’ve baked this recipe in many different shapes. The dough is easy to mix together by hand and is super easy to work with. Most importantly, the dogs love these cookies! 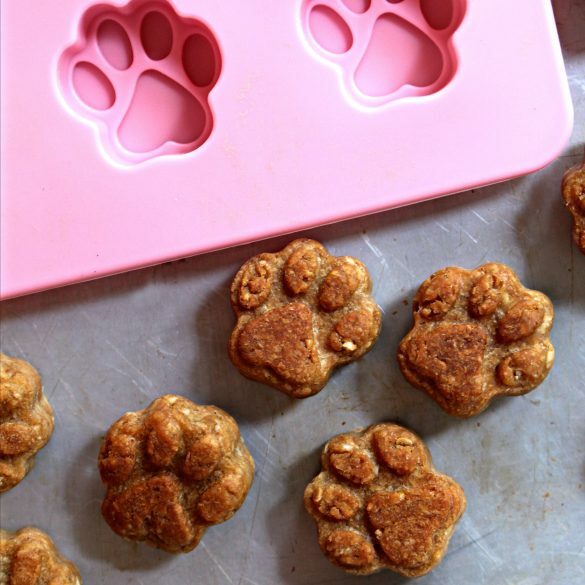 For my Paw Prints Dog Care package, I made Paw Prints Peanut Butter cookies a silicone mold. 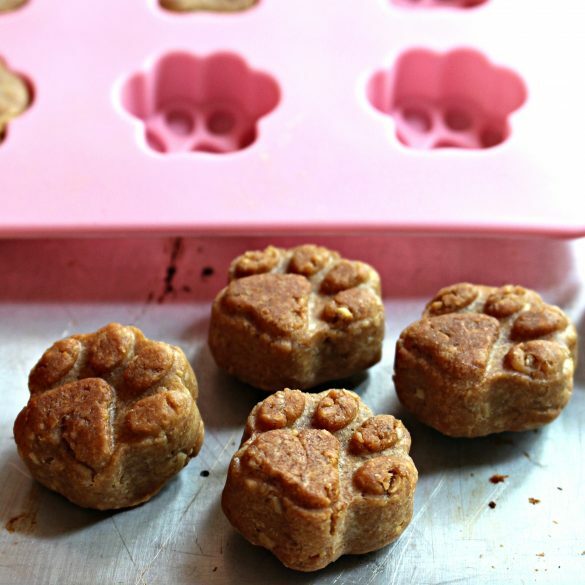 My mini molds hold a rounded teaspoon of the dough in each paw print cavity. The little cookies pop right out of the mold with no greasing necessary. Roll pieces of dough (small cookie- 1 teaspoon, large cookie- 1 tablespoon) into balls. Place on baking sheet and flatten into discs with your thumb. 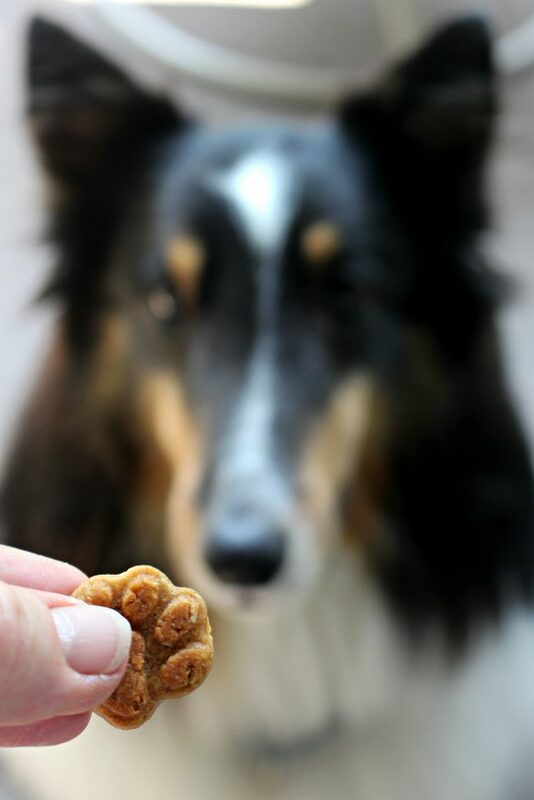 Looking for a grain free dog treat? Substitute these grain free flours for the wheat flour and oats. IMPORTANT: Keep in mind that different flours will produce slightly different results. More or less liquid may be required. Slightly different baking times might be needed. For example, I found Chickpea flour produced a cookie my mostly grain free Sheltie loves, but it is a stickier dough to work with and that extra moisture required an extra 5-10 minutes baking. The chickpea flour dough worked well in the mold and as a drop cookie, but was too soft and sticky to roll out. Most of us don’t need an excuse to spoil our own dogs. They offer us so much unconditional love. A few cookies as a reward seems fair! 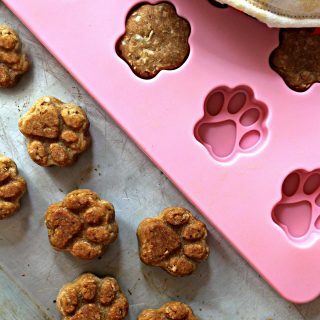 Send a “good dog” message to the cherished pups of friends and relatives with a Paw Prints Dog Care Package full of home baked Paw Prints Peanut Butter Dog Cookies. I bet you will get a lick and a snuggle in return. In a large mixing bowl whisk together the whole wheat flour and oat flour. Add the peanut butter, apple sauce, and egg, and stir to combine. Add the hot water, 1 tablespoon at a time, until a pliable (not sticky) dough is achieved. If the dough becomes sticky, mix in a small amount of additional flour. Place the silicone mold on a baking sheet and bake in the preheated oven for 12-15 minutes, then lower the oven temperature to 250° F and bake for an additional 20 minutes or until very firm. The dryer and firmer the cookie, the longer its shelf life will be. Remove from the oven. Remove the mold from the baking sheet and allow to cool before unmolding. Bake or freeze the remaining dough. Store in an airtight container at room temperature. 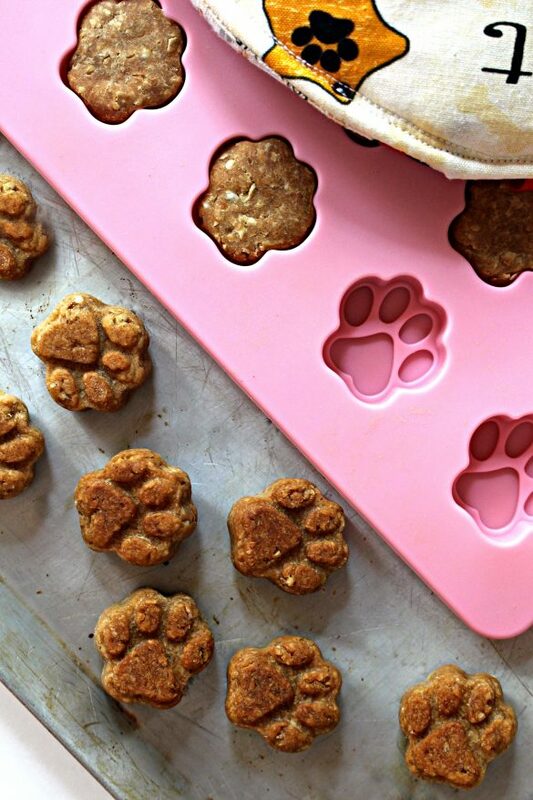 If baked until crunchy, Paw Print Peanut Butter Dog Cookies will stay fresh for at least one week. 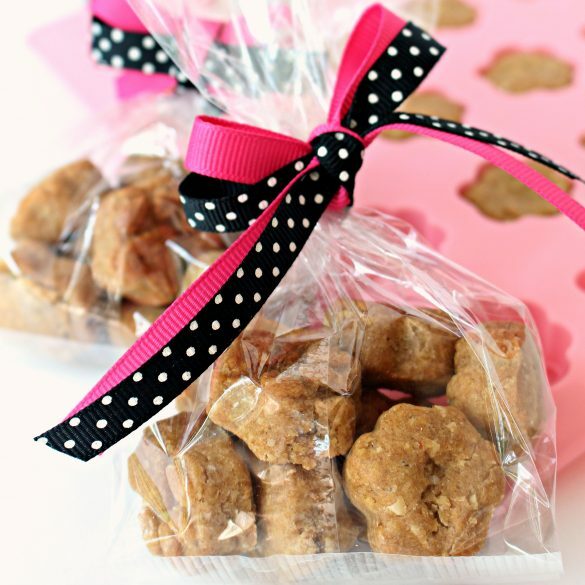 Place about 12 dog cookies in each individual zip lock or gift bag. Pack in a Paw Prints Dog Care Package with paw print themed items (bandanas, pot holders, magnets, mugs, etc.) and additional dog treats and toys. 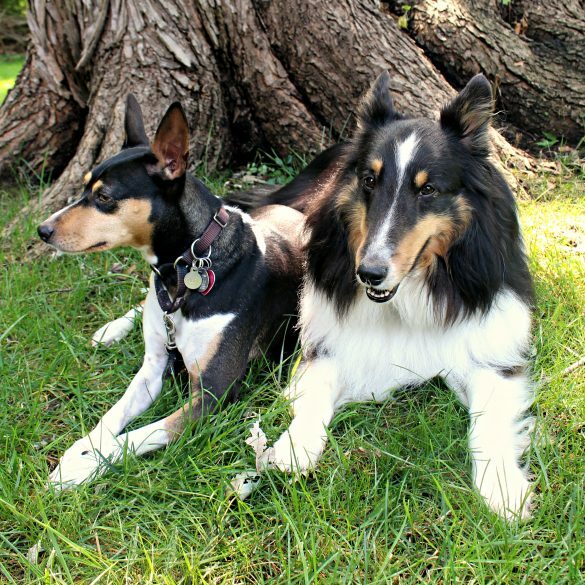 My dogs recommend these items for your Paw Prints Dog Care Package! Wendy, you’re like an onion. With each post you reveal a new layer and I discover something else about you, that makes me like and admire you just a little bit more. What a beautiful story about friendship, both the human and animal types. Tabby is very lucky to have you in her life. I stopped buying other treats when I tried your recipe. My corgi becomes “circus dog” when someone offers her one! Mixing is a cinch using powdered peanut butter, and no need for an egg if none on hand. Thanks for sharing!